madly off in all directions: Happy Birthday Dad! 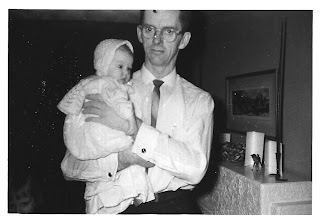 Today is my Dad's 75th birthday. Hoorah! though, that may only be the dawn of my time. Dad's always been fond of history and being born in 1933, he might find it interesting to know that it was 1933 that saw the debut of the film King Kong and the first photo of the Loch Ness Monster. I'm not saying it was a year of monsters, just that it was a very cool year. I went through all my old photos and found almost none of Dad. I suppose while we were growing up he was the one taking the pictures, so he wasn't ever in them. 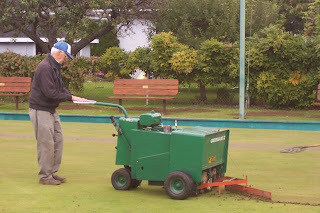 I took a gander through the internet and lo and behold I found a photo of him cutting the lawn at his lawn bowling club. Did you know that 1933 was also the year that saw the invention of the rotary lawn mower? Spooky. For all of his adult life Dad worked for the railway, starting out as a machinist and working his way round to management. Dad retired in 1988, and in those 38 years he never took one sick day, pretty impressive, no? After the first 35 years of no sick days the railway gave him a special sticker to wear on his hardhat. Hmmm... I think they should have done better than that, a medal maybe? Here's some footage of CN steam engine 3254, which lives in Pennsylvania now. I wonder if you ever worked on this one? Happy Birthday Grandpa!! Wow that was only 2 pictures of Grandpa. The bunnies are so adorable! You know he's airing the lawn not cutting it! He told me himself.